Steam mops use hot water and do cleaning job very well on hard floor and other surface. But in order to do the cleaning job better, the first thing you should make sure is that the steam mop itself is clean enough. If the mop is dirty, how could it clean the floor well? As we know, almost everyone know how to clean floor by mop, but not every people know how to clean steam mop effectively. Below we share some useful tips for you. Have you ever ues steam mop before? We all know that after cleaning a floor, the pad of steam mop is usually so dirty, so you need to clean it at once, and further more, what we should clean is more than this. Follow us and simply do the following 7 steps, you can do the cleaning job well. Step 1: Insert a new mop pad if the floor needs to be cleaned immediately and the existing mop head is dirty. Step 2: Wash the mop pad using a hot water setting, then tumble dry to sanitize the existing pad for reuse. Step 3: Change the water filter periodically. Water filter removes minerals and impurities from the water prior to steaming. Step 4: Remove the existing filter and replace with a new one according to the directions in the instruction manual. Step 5 : Kill mold growing in the water tank. Fill the tank with a 10-to-1 water-to-bleach solution. Step 6: Tighten the cap on the tank and allow to sit for two to three hours. Pour the solution out, then rinse the inside of the tank with standard tap water. Step 7: Reattach the water tank to the steam mop. Empty the water tank completely after future use. By hot steam generated by steam mop, it kills germs and bacteria effectively. The mop pad might be dirty if not maintained, and the inside of the water tank can mold if not emptied after use, that is what we should pay more attention to. Do regular cleaning to your steam mop, you can do your cleaning job easily and effectively. Conclusion: Although higher quality of skin care products cost more, you can use if for a long time and the average cost everyday will not be more. A classic cut decent clothes also can withstand the test of time, and you can wear it for more time, and will make you more confident. Old views: I will not buy that expensive cookware. Daily used kitchen supplies should not be of excellent quality. When it is broken, just throw it away. New Views: Kitchen is a woman’s important territory, and it is boring. If we select kitchen supplies with high quality, we can spare the time and the quality is better. Conclusion: A multi-function mixer can meet the demand for fine processing, although the price may be steep, the utilization rate can be increased. Regardless of the fact that good quality steam mop can cost more, it can help you to do the cleaning work better. New Views: repeated monotonous sweep consume much of your leisure time. When kids need to play with you, you are cleaning the floor. Maybe your husband will complain that you are always depressed. So if you let professionals do these, you can have more free time. Conclusion: Ask qualified ones to do the housework for you. For example, ask a professional staff to clean the air conditioner, to mow the law etc. Steam Mop: What Not To Do ? Steam mops resulted in placing a completely new spin over the surface of washing floors and I am very much sure of it that it would last for long. The price of some of the steam mops may be very high as they save a lot of time compared to bucket and mop system. They clean without any smell, spills, rinsing and needs less effort without bending or wringing the hand. Steam mops for floor should be handled with certain things that you can do for it. Steam mop acquires quick heating due to which foot of the mop becomes very hot in case if you are planning to place the cloth while heating is going on. If the steam mop is in use, then handling of wet mop head becomes very difficult as there is risk of shock. Take your own time for placing the head of the mop, filling up the reservoir with water and unwinding the cord before plugging steam mop. Plugging should be the end of the procedure. If filling of the reservoir is required at the time of cleaning then unplug steam mop before filling. Now you are prepared for cleaning the floor and plugging is done into an outlet. Do not leave steam mop idle may be whatever the case is while heating is going on whether you need to do some work or someone is there at the door or even if the phone is ringing. In case of steam mop heat is generated very fast and in certain models it is done within few seconds, so if it is left idle for long it would heat up and supply steam to the area where it is kept. If your mop is well prepared for use then plug it but in case if you need to do some work then first unplug it and then plug it again after doing work. When cleaning is to be done in another room then do the same again plug steam mop after preparing the room. In case if you skip sweeping or vacuuming of floor and proceed further for steam mopping, as it would be able to clear any type of the surface dirt like dirt, hair, dust, crumbs, sand or maybe hair of the pet. It may be proved to be fairly good, as it would produce dirt mess and mess the floor, even steam mop would not be able to work properly in such a case it would just be like washing up of the window using dirty cloth. In order to clean up the floor changing of mop head might be needed. The designing of a steam mop is done in such a manner that nothing else other than water can be used. Steam itself can do great cleaning of the floor without using any type of expensive or smelly detergents. In case if you have a big area of the floor and not single room, tempting can be done to keep cleaning the floor and avoiding dirt over mop cloth. But keep checking once at a time if mop cloth needs to be changed. But before changing cloth do unplug steam mop. Cleaning of the floor using dirty cloth may spread dirt over the floor as described in third item. It is good to carry more than one spare cloth simply in hand. The designing of steam mop is not done in a way such that it can be used over unsealed laminates, floor and wood. The floor in which mop has to be used should not have lifting corners over adhesive tiles or hot water. Steam provides a lot of moisture that makes the wood composite swell. But it does fairly good job in case of sealed surfaces like vinyl, ceramic tiles, laminates, woods, and vinyl tiles. Using steam mop as a wall washer is not bad, hot steam generated by mop allows the bubbling of paint, and then it is either lifted up or peeled off. Make use of steam mop over the walls only if you are planning for repainting. In case if you are planning to wash your car with it then there is a great risk and repainting of car is very costly. Storing of steam mop with the wet cloth may result in the growth of mildew and it would spoil cloth head. The cloth should be removed after the mop is cooled. You may place a neat cloth if you are prepared for using it another time when required. The dirty cloth should be laundered soon so that all stains are removed easily that might settle down. Though steam mop is much different from what you used to use yet there is no need to be afraid of using as it simply needs care. In case if you receive it as a gift then simply open the box and go through the brochure for using it. You would experience that washing floors with the steam mop is something good and will make it your new friend. You would not regret the task of washing the floor any longer as it would become very easy for you. One of the wonderful cleaning tools is a steam mop, but the way of using it is different based on the efficiency of cleaning. Though steam mop is a creative floor mop yet it requires certain prep work in order to obtain clean floors. Steam mop provides much better cleaning system in comparison to bucket and mop system for cleaning floors. In case if you want to be happy with your purchasing then be aware of the guidelines for using the steam mop. It is very important to vacuum the floor before steaming it. An alternative of vacuum is sweeping that has a good capability of sucking things from cracks like dust, lint and other debris on the surface that might result in making the mop head dirty. After vacuum, the floor is prepared for steaming. There are certain steam mops or sweeper tools available in markets that have a dual function. Though they can be easily handled and perform reasonably yet you cannot avoid vacuum when it comes to cleaning of small areas or messes. Regarding complete floor vacuum has the capacity of cleaning a lot of dirt before using a steam mop, due to this less dirt exists on the pad of mop, thus it provides better cleaning. Maintenance means that steam mop should be used when the floor is not very dirty. In case if your floor is soiled heavily then make use of hot steam for smearing away the dirt from the floor. The result would not be the same as desired. Steam mop works perfectly if the floor is being maintained regularly and requires little cleaning. In case if you have bought a new steam mop then first clean up the floor in the old manner and then make use of the steam mop routinely as you do. Floors can be often cleaned up using the steam mop as it requires less work and time, and it would save a lot of it in the long run. More than one mop pad may be used based on the requirement as you do not want the dirt to smear around while the steaming is done on the floor. Basically, I prefer to start with the laminate floors and then move ahead to vinyl and keep changing the pad as per the need and very especially when I reach the entrance which means faux tile to have great shine without smear. Steam mops are available at reasonable rates; they are basically well washed in the washer and they are hung for drying especially in case of microfiber. In order to be aware of all the instructions that need to be followed while taking care of the accessories and steam mop do refer to the product manual. To ensure proper cleaning do change the pad of mop when it is dirty. After the use of steam mop does remove mop pad from streamer for laundering. It is not one of the important needs but in general the care of floor. The steam mop should be used over the sealed floors as the excess of moisture would spoil some of the surfaces. In case if you are doing anything else do not leave the steam mop plugged in, moisture can be collected over the pad that might spoil the surface of the floor. One of the best rules of thumb can be used for testing hard surfaces, in case if you are not able to recognize it keep on moving the steam mop. Do not permit it not to occupy any of the spots. If you have made sufficient use of steam mop, then let it cool down over the sealed surface and remove the pad as fast as possible. I know that you won’t believe me, if I say that there is a gadget that makes even mopping a pleasant experience! But after you take a look at its features, you will surely agree with me. The Shark professional steam mop is mopping equipment which is very easy to use and also heats up really quick. It does an excellent job of cleaning tile, hardwood, laminate, linoleum and even carpet! If you compare the Shark professional steam mop with other mops, it is more convenient and does a much better job. As other models are relatively much heavier and bulky and do not clean up the corners as well as the edges of the floors as effectively as the shark professional steam mop. It glides nicely along to reach the most remote places like the area under the cabinet as well as the lips of the stoves and refrigerators. The professional pad of the has little fingers all over it that helps in giving the floor a light scrub and because of them, it does a great job of cleaning even the dirtiest floors! ATTENTION: Avoid going to the store just to find out that the Shark Professional Steam Mop is OUT OF STOCK! Order now to avoid disappointment and get it for sure! Don’t spend more than you have to! We already done the research for you. The Shark professional steam Mop – S3601 provides steam control to give a superior and much improved sanitization to your hardened and dusty floors. In order to get the best results from the Shark professional steam mop, you need to clean the mops pads whenever they get to dirty so that the steam is able to come out and effectively clean the floor. If you follow this procedure, you will get the professional and high quality results from the Shark professional steam mop that you’d expect. There are different ways in which you can use your Shark professional steam mop for achieving and getting the desired results and satisfactory sanitization. There are 3 Steam settings that you can activate for all your floor surfaces so that they get cleaned up properly and efficiently. Dust for light cleaning. Mop for everyday cleaning, and in addition to this, it provides scrub for hard and tough cleaning. A large water tank is used to engage in extra cleaning time. The Shark professional steam mop also includes two of the quick mop release heads. One that is rectangle and one that is a triangle. It also has three fast drying, deep cleaning steam pads that are the re-usable type and the carpet glider. The Shark professional steam mop comes at a price of $129 for the basic white one or $149 for 3 quick release mop heads, 4 premium microfiber pads, extra long 30 foot cord and is most likely to be shipped to your home in the duration of twenty four hours if you order it. But that depends on the supplier or the firm that is selling this professional mop as different outlets have different guidelines and rules which suit their requirements. I prefer Amazon.com because they always have the cheapest price. There are also some additional features of the Shark professional steam mop that include electronic steam that has the capability to shut off automatically; also it has the advantage of a swivel mop head which rotates 180 degrees. The Shark professional steam mop has an impressive cleaning width of 12.0’’ and water tank capacity of 500 liters. This made the Shark professional steam mop one of the best mops available in the market today. Water Tank Capacity: 500.0 Lit. Where To Buy The Euro-Pro Shark Professional Steam Mop? You can buy the Shark Professional Steam Mop from many big retailers offline or online like Amazon, Best Buy, Target, Walmart etc. But which one is the best? We have done work for you, we find the best place to buy the Shark professional steam mop is at Amazon.com.These giant online retailers give the best price. Amazon.com is a reputable company that stand out in customer services. You will have a piece of mind because not only they will make sure you get the Shark professional steam mop on time but they are very active in updating you the status of your delivery. Don’t spend more than you have to! We already done the research for you. Click to find out where you can buy Shark Professional Steam Mop – S3601 . When it comes to performing house cleaning up to a certain standard, using elbow grease may not be quite enough to produce the most desirable results. With this in mind, it would be wise to consider getting help in the form of an effective and reliable steam mop unit. For those who are sticklers for cleanliness sans all the hassle, only the best rated steam mop would do, and the Bissell Powerfresh 1940 is one of the units to consider. Below is an honest and comprehensive steam mop review that contains critical information regarding this product, which would educate prospective buyers and allow them to form a wise decision regarding whether or not this steam mop is worth purchasing. Tackling different kinds of dirt and stains can be challenging, but not if you have a reliable helper like the Bissell Powerfresh steam mop. It is equipped with SmartSet Steam Control, which allows the user to limit the amount of steam that gets dispensed based on the immediate need. Cleaning up all types of mess would not be a problem with this mop as it is designed to adapt to a wide range of requirements as they may arise and the controls are right on your fingertips. One of the most annoying things people have to contend with when using steam mops, or any cleaning device for that matter, is having to lug them around the house. This will not be a problem with the Bissell Powerfresh 1940, since it barely weighs 8 pounds. Some vacuum cleaners are heavier than this steam mop, which should give you an idea as to how nimble it is. Having a cleaning tool this light around the house is a godsend to people who have problems carrying or pushing heavy machinery, i.e. as in the case of those with back problems, arthritis, etc. By choosing this unit, you are not only saving time and money, but you are also effectively saving your health. Maneuverability is one of the most important things to look for when scouting for the best rated steam mop. This happens to be one of the many features of the Bisssell Powerfresh 1940, which allows users to effectively clean corners, edges, and other hard to reach places that would otherwise remain filthy. This added feature is one that many homemakers have been clamoring for, especially those who prefer their homes clean as well as fragrant. The removable discs contain Spring Breeze scent, which is released throughout the house as you clean. Should you not prefer to use the Spring Breeze fragrance function, you can simply detach the disc and use only the steam. Considering its nifty features and benefits, it is a tad surprising that this steam mop is sold for under a $100. It is even sold at a discounted price at certain online stores such as Amazon.com. Almost every steam mop review from customers who bought the Bissell Powerfresh has been positive, except for some minor criticisms. Most users have lauded this steam mop for its lightweight body, which made it easier for them to clean up in half the time and almost a fraction of the effort. While the mop itself is lightweight, its performance is anything but mediocre based on the experience of hundreds of users. The steam control options (low, medium, high) also made a great impression since this feature made cleaning more efficient and economical. Users can choose exactly how much steam they wish to use for different surfaces and stain types, which is something that is lacking with most other steam mops in the market. The price is also a very high selling point for most customers who viewed this product. It is in fact priced quite competitively, which is more than what most people can say about other steam mops for sale today. Based on this steam mop review, as well as the hundreds of positive comments by satisfied consumers, it makes perfect sense to recommend the Bissell Powerfresh 1940 to anyone who wants to change the way they clean. Welcome to my Best Slow Cooker site and Slow Cooker Reviews blog, good day all! This is Peter, and I am a family man with a busy schedule. My passion for cooking fuels my desire to provide great tasting meals for my family despite my hectic work schedule. The slow cooker, despite its name, is a wonderful appliance for the working people who don’t have time to cook. Do read on to find out why and how to choose the best slow cooker! I’ve come up with several slow cooker reviews to help you decide which slow cooker is ideal for your situation because there are so many on the market. Besides that, slow cookers are different in design from other kinds of cooking appliances so I bet you’ll appreciate my short introduction on what a slow cooker does and how it can work magic in your cooking life! This means I’ve done all the hard work so you don’t have to! Besides that, I’ve included some handy tips that will help you start on your own slow cooker journey so you’ll be making yummy one-pot dishes in no time at all! Bon appétit! After trying out so many models, I can safely say I have tried my fair share of lemons and great slow cookers. 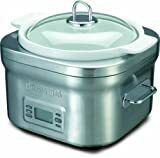 My top slow cooker reviews however are listed in this site and I hope will help you make a decision on which slow cooker to buy for your needs. Best Slow Cooker – Great performance with programmable functions. Best Small Slow Cooker – For the singles and couples. Best Budget Slow Cooker – Cheap and works great. Good for small meals. Best Basic Slow Cooker – No frills, just cook. #1. Size – Slow cookers are measured in quarts. Get the right size for your household. #2. Shape and Design – Round, oval or square? A good design will help you cook better! #3. Settings – Do you want a basic slow cooker or one with all the features? There are timers, temperature settings and more. Go straight to my detailed guide about how to choose the best slow cooker here. Every day, my wife and I ponder over what to feed our 3 kids come dinnertime. Ever since she started working again, we have had to think of how to provide a good, nutritious meal to our kids while still being able to balance our work responsibilities. As I thought about it more and more, I decided to use my trusty slow cooker for a great-tasting solution! Not only are slow cookers wonderful at cooking on a budget and for long periods of time, but they also make for easy food preparation and easy clean up after. This solution totally fits into our busy schedules. Before I leave my restaurant and she goes to work, we decide on the day’s meal and put our trusty slow cooker to use. By the time she comes home for dinner with the kids in tow, they have a great meal to look forward to. Not to mention, she can keep the leftovers warm so I can share in the fun when I come home too! Cuisinart has never failed to deliver quality and durability. Now they have made a small slow cooker, well I do say small because my average size of a crock pot is enough to feed at least 6 or 7 people. The Cuisinart PSC-350 is the best small slow cooker for singles and couples who cook. If you have a small family of 3 this might work fine too. This 3 and a half quart small slow cooker is a better choice than my earlier pick on the best small cooker for a couple of reasons. The unit itself and the pot come in an oval design, this is great for storing and keeping, nothing like a good little pot that conserves more space than others it size, as I myself enjoy a lot of counter space for whenever I have the urge to whip out a quick meal. The pot is made out of ceramic; it won’t be as heavy as the stoneware ones, but I can’t say that I noticed any difference in between the two so I did a little research. After researching I was taken aback by what I discovered, a slow cooker and a crock pot are not always the same thing, and Crockpot is a generic term like Blanco or Aspirin, but that I shall set aside, since I have been using the term for well over a decade now. The glass lid and the pot are all dishwashers safe, easy cleaning if you ask me. The Cuisinart PSC-350 is a programmable slow cooker, simply means they would give you a bunch of buttons to adjust the time, the temperature and which elements you should use, I remember one of my mum’s slow cookers which had these functions; it wasn’t anything famous, since it was made in China. This slow cooker is very easy to use. It has 3 settings, simmer, low and high. There is not much brain work except deciding what temperature you want your meal to be cooked in. Simmer gives you slightly above 180 degrees Fahrenheit, while Low gives you about 200 degrees Fahrenheit and High is just a bump above that at 212 degrees Fahrenheit. The buttons look like the ones I have for those digital photo frames, but a lot sturdier and well made, also that they are touch sensitive, so everything can be done by just running your fingers over the buttons. The LCD display is always on for the duration of the cooking and warming, until it is turned off. This is a useful function especially for the after dark cookers. Now let’s take a look at the process of cooking with this thing. You are given 4 cooking modes, the 3 mentioned earlier and the keep warm function, so depending on what you are cooking select the mode and set the time, and then the cooker does everything else for you. Well, I do admit that there is nothing much to a slow cooker, but to be on the safe side let me list out the safety measures taken by Cuisinart for this cooker. It comes with no slip rubber feet, quite useful, I tried to bump it a few times but it never did budge, unless it was empty. The handles always stay cool even after hours of cooking, but I can’t say the same for the unit itself, but it’s not something to worry about just as long as it far away from the grasps of curious children. So overall this Cuisinart PSC-350 is a great addition for a newlywed couple or a bachelor’s kitchen for making meals simpler. Even if you can’t or don’t know how to cook, the handy recipe booklet that comes with the unit will be of great service. Slow cookers are just great, especially during those days where you are not home most of the time, or you just want to sit back and relax without having to worry about dinner. The Hamilton Beach 33967 is simply the best programmable slow cooker. This slow cooker is nothing small, it has a 6 quart pot, made of stone, really big, I could cook up extras with this pot, and 1 pound of sliced chicken is not a problem for this large cooker. The pot has an oval shape, so you could get creative, think about leaving a whole chicken in overnight and having it the next day. The thing about this crock is that it’s made of stone, and its heavy, but that’s a good thing, because it’s almost as similar to the ceramic ones which would break really, really easily, it’s also dishwasher safe, but I think that this crock is washable by hand just fine, all you have to think about is the weight. The functions on the Hamilton Beach 33967 is amazing, it’s got almost everything that a slow cooker needs. The program function allows me to set the time and temperature I need, this is really great for simple things like meat, I just set the time to how long I want it to cook and I leave it, after a few hours I return with a ready and always warm meal waiting for me. It has an easy to see LED display, very useful especially at night when you don’t want to turn on the lights in the kitchen. Should I buy this slow cooker? The handiest feature that comes with this slow cooker is the probe function. This monitors the temperature of the cooking and keeps it at a controlled level. When it reaches to a point where the temperature is suitable it will maintain that temperature by switching itself to keep warm and back to cook again if it were to drop. The reason why they call it probe is that you have to stick the thermometer they gave you into the pot, that’s right, set it to probe and probe the thermometer into the pot and leave it. The clip on the tempered glass lid is really something, it may be really troublesome to lock and unlock but it’s crucial for a slow cooker, as some ingredients tend to bubble more than other and possibly causing a mess, well I for one do not want to come home to my dinner which is on the floor instead of in the pot. The lid also houses a spoon; I mean the spoon clips itself onto the lid for safe storage. Who should not buy this slow cooker? This slow cooker may be almost perfect, but it does receive some complaints from users about power interruptions. Imagine leaving your food for 7 hours, but the cooker stopped itself during the first 2 hours, that would leave you with uncooked and spoiled food. This is actually a programming error that causes the cooker to stop itself too early, maybe Hamilton Beach should have made the controls easier. Overall it has a great performance, is easy to move around, just a tad heavy. If you need a programmable slow cooker, Hamilton Beach 33967 is a great buy and comes at an affordable price. This is my most favorite of the lot! KitchenAid KSC6223SS 7-Quart Stainless Steel Slow Cooker is the best slow cooker I’ve worked with. This slow cooker review will help you why I think so. In my line of business, food preparation matters. A lot. And I’ve had experience with great slow cookers, and some not so great ones. And when it comes to my family, I’m even pickier because I only want the best for them. This is simply the best slow cooker of them all. It meets my family’s needs and my own. Whether we’re making beef chili for home consumption or I’m making consommé at the restaurant, this baby performs each and every time. I have a large family, so I like its huge capacity of 6 quarts. The 10-hour programmable timer helps me design the perfect cooking style for specific dishes, e.g. you wouldn’t roast chicken the same way you make beef stew, correct? My wife loves our KitchenAid KSC6223SS 7-Quart Stainless Steel Slow Cooker at home, which is brick red and matches our other kitchen appliances. Women. Go figure, right? The one at the restaurant is the classic steel although there is a black version as well. I personally think it’s very well designed for a slow cooker, which is why I like to use it so much. It is oval, which is great for cooking chicken. Most slow cookers are round and cannot accommodate a whole chicken. Besides that, there are quart marking on the interior. I like the markings because they help me fill it with liquids accurately. We trust our kids around this model because the large handles and rugged design prevent any damage to it and our children. Large handles always help when you’re carrying a heavy pot of liquid, don’t you think? Basically, if you need a large capacity slow cooker with good features and performance and don’t mind the hefty price tag, KitchenAid 7-Quart Stainless Steel Slow Cooker is the best slow cooker to get. I can personally attest that it has blown me away! If you’re not sure, check out my other slow cooker reviews to look for another model suitable to your needs. P.s. The warranty’s good too. If it spoils during your first year of usage, KitchenAid will deliver an identical or comparable replacement free of charge to you. On top of that, there’s a one-year warranty on the replacement unit as well. Now that’s what I call a great warranty. I thought I would buy an extra slow cooker to cook small meals sometimes when only my wife and I are eating at home. I was looking for a cheap but good one. Hamilton Beach 33231 was cheap; it only cost me below $100 just to have it shipped to me. It has been a week now and I have used it every single day, it’s something I do when I buy a new appliance, I call it the burning process, where I use something new intensely for a week, just to see if there were any flaws or anything I missed before the warranty ends. So this is what I found out about this 4 quart oval slow cooker. After using it I always clean it and keep it back in storage, I know this can be a really troublesome thing to do, but its only for a week, so I found that the oval design was easy to store compared to some round ones (and even a square one that I used to have). The size is not too small or too big, it’s just right, and cleaning for this unit is fairly simple since the pot and the lid is dishwasher safe, and yes I used my dishwasher to clean it every single time during that entire week. The unit has a brushed stainless steel body; this means that no matter how much you smolder or “molest” this slow cooker you won’t be able to find fingerprints on it, unless your hands were dirty. Now let’s see how well this slow cooker cooks shall we? The dial reminds me of those old slow cookers, the ones from Asia, like Phillips and Sanyo, this dial comes with low, high and keep warm settings, above the dial you can see a signature which says “Crockery” that’s sort of amusing since this is a slow cooker, or maybe the manufacturers didn’t realize the difference between the two. So I tried some extra long slices of meat and vegetables and the pot literally swallowed it up, after a few hours I was met by a complete meal, quite the pleaser I would say. The on and off indicator light lets you know if the unit is safe to touch or not, this is because the body will heat up during cooking, and imagine yourself walking about your kitchen one night to bump into it while it’s turned on, not a good experience I assure you. The handles remain cool even in the heat of the kitchen, a regular safety measure which all slow cookers should have, but there is one bonus about the see through glass lid which I notice most slow cookers do not have, aside the fact that you can see through it to take a peek at your meal, this glass lid has a knob which does not heat up. That is an amazing add on that I suppose some manufacturers fail to see, now I don’t have to place a thick kitchen towel over the lid or wear a mitten when I want to remove the lid. After your meal is done you can use the pot itself as a serving dish, it looks great with its ceramic coated in his temperature black enamel, you won’t be embarrassed to place it out on the table during dinner, just be sure to line the bottom with a towel first. 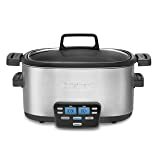 This Hamilton Beach 33231 – Best Budget Slow Cooker slow cooker comes with the regular cookbook, there is nothing special about that, but I would definitely urge my friends to buy this slow cooker, especially those who have a small family and are looking for a budget slow cooker. Whether you plan on making a 7-pound large roast or a huge batch of soup for a large family occasion, the Crock-Pot SCVT650-PS programmable slow cooker will be more than sufficient with its 6.5 quart capacity. The touch screen control panel provides easy access to all the controls of the crockpot such as low cook setting, warm and high cook setting. This is its temperature selection range. Then there are time setting options, start button and up/downtime selection switches with a power icon and power switch. The delay timer can operate up to 20 hours late and starts from 30 minutes. It comes with automatic shut down and keeps warm modes. With ample amount of delay timing, you can cook overnight, refrigerate leftovers in the morning and tuck in at night. The size and its features let the Crock-Pot SCVT650 prepare food for a large family once for the entire day. Its the perfect solution to a busy life. Auto keep warm lets the food simmer until you return home, maintaining its texture and flavors without burning it. Design wise it features a metallic finish with metal side handles fitted with silicone for comfortable and secure gripping. The shape is oval to accommodate a large cut of meat with ease while the lid and stoneware pot makes it easy to clean and serve with. I went on-line looking for this particular crock-pot because it had such a high rating by Cook’s Illustrated magazine. They were right again. It’s everything they said it was and I’m very happy I got it. Would recommend to all! Our experience with the Crock-Pot SCVT650-PS has been good. This is not your average slow cooker that is unusable in the low temperature setting nor is it too high at the high temperature setting to burn any recipe. It doesn’t feature a hinged lid and neither is it expensive. These according to us were the standout features in this slow cooker. Having experienced cheap supermarket grade slow cookers in the past that managed to nuke our food, we wanted something a bit more beefy, with more juice and reliability than before. Now in our three weeks of experience, we came across plenty of pros and few cons for the Crock-Pot SCVT650-PS. First, if you set the unit at low, then expect a simmering of dishes, which is actually perfect for recipes such as dahl, curries and Indian lentils. The low temperature setting is also useful for making Chili Verde, Beef stew, soups, stocks and even baked beans Usually, on the low setting 10 hours or so cooking time works well. Since food cooks very slowly in this setting, there is no chance of getting hot spots, burns and sticky food. Moreover, the stoneware pot does seem to dissipate heat evenly, regardless of whether you use it in the low or high temperature setting. Plus, its stainless steel styling does bode well with our modern looking metal filled kitchen. At least, it doesn’t look flimsy like many other brands. Coming to things that need a bit of improvement, the control pad isn’t exactly user friendly. Numbers are kind of hard to read and you need to look at it closely to figure out what settings have been used. Moreover, being digital in nature, the heat from the unit may damage the circuits after a while. Not sure if this will ever happen but we have witnessed this in other models. Besides, the pot does seem to heat up quite a bit when used extensively. Although it’s not much to worry about, you may want to keep your fingers protected by sticking to the handles only. Thing is there aren’t many other slow cookers for under $100 like the Crock-Pot SCVT650-PS that features good quality construction, decent functions and good customer support. So, overall its definitely a dependable and useful slow cooker to have around. Both the stoneware pot and glass lid are dishwasher safe. 6.5 Quart capacity, removable stoneware pot with the oval design. Stainless steel finishing with silicone fitted metallic side handles. Touch screen controls, automatic shut down and keep warm feature, programmable timer. Features a 1 year limited period warranty. Not everyone is used to slow cooking. Those who have tried this art usually end up making recipes on the stove-top simply because of the time it takes. Now the Crock-Pot SCVT650-PS does not really make things fast. In fact, for a slow cooker it takes a lot more time than usual. 10 hours on low setting and 4 hours on high setting is kind of snail pace. However, this also means that food never really gets burnt, stuck to the pot surface or develop hot spots. Hence, folks who enjoy slow cooking and recipes particularly designed for crock pots will definitely love this equipment. Its also a good starting point for people learning the art of slow cooking as the chances of going wrong are limited with the Crock-Pot SCVT650-PS. The Cuisinart MSC-600 3-in-1 Cook Central 6-Quart Multi-Cooker is not just your average slow cooker but also a multi-cooker by design. It’s a kitchen chef on its own with programmable controls and functions that let you do more than just cook. You can saute ingredients, brown meats and prepare all your favorite recipes in a single pot. It features a 6 quart oval design with non-stick coating on the inner pot that lets you saute and brown with ease. Moreover, once cooking is done, it switches to the keep warm mode automatically letting you serve up straight from the pot. Cleaning up is also easy thanks to the steaming rack, pot and lid all being dishwasher compatible. In the slow cooking option, you get a choice between high, low and simmer temperatures. This is ideal for preparing varied recipes, some that need to sit for over 10 hours and others that must be cooked in under 3. Moreover, a 24 hours delay timer takes care of when you want to start late. With the steaming rack, you can steam your greens and even prepare shrimp, fish and what not. Just add 2 quarts of water or any liquid that you choose, cover the lid and let the steaming complete. The Cuisinart MSC-600 also sautés and browns as mentioned before. Whether its a skillet dish or a simple family recipe, choose to saute or brown at 350 degrees until ingredients are soft, perfect and ready. I would definitely recommend this product. The heating is fast and the food doesn’t stick to the pocket. Not to mention, it doubles up as both a rice cooker and a multi-cooker. An outstanding appliance and I just love it!!! Our first item on the menu was a pot roast for the Cuisinart MSC-600 3-in-1 Cook Central 6-Quart Multi-Cooker. It wasn’t our first time and so we knew exactly what to do. Having read through the manual for this slow cooker, understood its temperature settings and various functions, we decided to go ahead and brown the meat, braise it directly in the slow cooker and cook till finish in it. The end result was a wonderful taste and splendid texture. Best of all, cleanup was rather easy after we devoured the roast. It is definitely worth purchasing since many crock pots in the market have failed to deliver when they tend to multitask. The Cuisinart MSC-600 however doesn’t seem to fail at either of its triple functions. We feel that this slow cooker is capable of managing three to four uses in a week. Although it is a slow cooker, by no means, does it take ages to complete? In fact, the low temperature setting is just high enough to complete the most delicate tasks in under 5 hours. And as for the high temperature setting, it’s like cooking at 375 to 400 degrees F. This is why the Cuisinart MSC-600 can cook recipes in under 3 hours at high temperature setting. Plus, its kind of attractive looking with its sleek outer stainless steel surface and pot insert. The glass lid with handles, additional handles on the crock pot and the bottom positioned control panel all give it a futuristic appeal. In fact, it’s not all design with this slow cooker. For starters either of the handles never gets hot and neither does the rim of the glass lid. This is great as it means you can carry it to the dinner table the moment it’s done the cooking. Moreover, washing it is not at all hard. Although the use of non-stick coating means that you can’t really use a dishwasher, at least cleaning it by hand does not take much time. Plus dried food seems to come off real easy without any scrubbing necessary. If we were to highlight its one standout feature, we would definitely go for its browning and sauteing multi-function We never have to dirty other dishes, take out the skillet to brown or braise meat. Moreover, we did not find anything in particular that we disliked. It is well made, designed to perform and has a long warranty coverage to satisfy the most cautious of buyers. Combination cooking for recipes that require special treatment. Removable stoneware pot of 6-quart capacity. LCD backlit display with temperature and time readouts. Cool-touch handles on the glass lid helps in easy handling. Steaming rack, pot and lid are all dishwasher safe and removable. Features a 3 year limited period warranty. Think of a slow cooker and you immediately realize all the preparation that goes into making a dish in it. Now, the Cuisinart MSC-600 3-in-1 Cook Central 6-Quart Multi-Cooker differs in this respect as it manages to multitask as a skillet and steaming machine. So, instead of using too many dishes and ending up cooking in the slow cooker, you prepare all your preliminary ingredients right in the slow cooker’s stoneware pot and then add in all remaining ingredients, cap the glass lid and set the cooking time with appropriate temperature. It’s easy, simple and effective. The DeLonghi DCP707 Stainless-Steel Programmable 5-Quart Slow Cooker features three cooking modes – High, low and keep warm. It has a timer function as well. The cooker also automatically switches to warm mode for 2 hours after the timer has finished its countdown. The cooker has a tampered glass through which one can see what is happening. Other features include stay cool handles, and non-slip feet. The cooking pot can also double up as a serving dish. We found Amazon.com to have the best prices on the DeLonghi DCP707 Stainless-Steel Slow Cooker. The DeLonghi DCP707 measures 13 by 11-4/5 by 9-3/5 inches and comes with one year warranty. The design of this cooker is attractive. The stainless steel looks good and the same can be said for the touch control panel. The cooking pot feels sturdy and can be handled easily. Its 5 quart capacity is good enough for most recipes and family cooking. The display is clean and switching settings is really easy on the panel. The cooker is dishwasher safe so cleaning is no hassle. The function of this cooker is just as good as its design and build. Three heating modes cater to all levels of slow cooking. The keep warm mode is really useful. Food stays warm for as long as 2 hours inside the cooker. Reviewers mentioned that if food is left inside the cooker, even after the cooker switches off, the food remains warm for quite some time. The cooker automatically switches to ‘keep warm’ mode after the timer finishes its countdown. This is another handy feature included. Reviewers also liked the idea of having tempered glass. Many cookers feature an opaque top which does not permit you to monitor food. Slow cooking needs monitoring and hence the glass lid is a thoughtful design and functional implementation. We think that the DeLonghi DCP707 Stainless-Steel Programmable 5-Quart Slow Cooker is a good cooker and worth having in your kitchen. Reviews were positive but they did have one minor grouse – The price. This cooker is overpriced. While it looks and performs well, we feel that it should be priced lower. The price notwithstanding, we would recommend it. The West Bend 84966 slow cooker improves on its previous griddle type heating base slow cookers by providing a programmable timer and electronic controls. This slow cooker features a 6 Quart cooking bowl with a tempered glass lid that is freezer, oven and stove safe. With three temperature settings with an option to switch to griddle cooking, the West Bend 84966 provides sufficient versatility. This slow cooker also uses a countdown timer with an automatic shut off after 24 hours. The cooking pot is oval or oblong shaped instead of being round like orthodox slow cookers. It comes with a coordinated recipe book that provides precise instructions and recipes specifically for this slow cooker. The West Bend 84966 is protected by a one year limited warranty, which helps to ensure that you’re going to get a slow cooker that’s going to last. I am a complete “non-cook” and I look like a five-star chef when I use my West Bend Versatility slow cooker! We got the West Bend 84966 slow cooker about a month back from Amazon and have since used it on weekends to prepare a feast for our friends and family members. The programmable timer is one reason why we don’t mind using it on weekends because it allows us to set the temperature and timer simultaneously and forget about it. Last week, we made our special lamb stew recipe using the West Bend 84966 and it came out exactly as we have come to expect. Considering the fact that we were using a slow cooker for the first time for this recipe, we decided to get premium quality lamb and chopped up some vegetables, adding them to the slow cooker along with other ingredients, herbs and spices. We set the temperature and let it cook for a good 9 hours on low setting. In the meantime, we prepared a few other items on the stove and took a stroll through the park nearby. By the time we came home, it was ready and we were eager to taste our slow cooker’s creation. It was just perfect. The lamb was succulent and the flavor was caught exactly how it needed to be. There’s no evaporation with the West Bend 84966, which helps to capture all of the juicy flavors with each meal. The instruction manual suggests that the hot plate can double as a griddle and so we did try out making omelets on it for our breakfast along with tiny pancakes. It works splendidly and because of the programmable timer, we can simply set a temperature and leave the food to cook itself out in the open without ever worrying about the food sticking to the plate, because of its high quality non-stick surface. The West Bend 84966 is also easy to clean up considering the fact that the cooking pot and its glass lid is dishwasher safe. For the heating base, a simple wipe with a wet cloth is all that is needed to keep it clean. The design of the West Bend 84966 initially gave us a scare considering how it blatantly deviates from traditional crock pots. However, having used it for a month now, we feel confident about its innate abilities as a slow cooker. Its designed for multiple functions and offers good performance in all temperature settings – and not to mention, the West Bend 84966 is extremely durable and sturdy. 4 Electronic temperature settings of high, low, warm and griddle with 24 hours automatic shut-off. Cooking pot accommodates 6 Quart comfortably; tempered glass lid shuts moisture inside. Programmable control panel with easy to read LCD panel and soft buttons. Dishwasher safe lid and cooking pot. Exclusive West Bend 84966 Recipe book; 1 year limited warranty. The advanced West Bend 84966 slow cooker brings in programmable controls and a backlit LCD panel to an already popular and inexpensive line of slow cookers from West Bend. This new model works great, has got the same dependability as more expensive models and makes slow cooking that much easier, and much more fun. A larger 6 quart capacity can cook a large meal or make a small serving for one, making it highly versatile and useful on a daily basis. If you’re tired of using and cleaning the same kitchen utensils over and over again then the Cuisinart MSC-600 3-In-1 Cook Central 6-Quart Multi-Cooker may just be the solution to your problems. This versatile device will allow you to saute veggies, brown various types of meat and slow cook all kinds of comfort food using just one unit. So if you’ve made a hobby of cooking then this is one device that you should definitely add to your kitchen cabinet. This particular feature is useful for checking on the progress of each dish without having to worry about opening the lid. The Cuisinart Multi-Cooker’s steaming features will allow you to place your ingredients on an elevated position, so as to prepare them for steaming. The non-stick aluminum cooking pot allows for the even distribution of heat around the cooker, so to make your food tastier. This special feature will allow you to brown and saute your various ingredients right within the unit itself. The Cuisinart Multi-Cooker’s removal parts can be cleaned in a dishwasher. This also includes the steaming rack, and it’s worth remembering that each of these parts have a 3 year warranty. So if ever one of them breaks down, you can have them replaced quite easily. Finally, it’s worth mentioning that the Cuisinart MSC-600 3-In-1 Cook Central 6-Quart Multi-Cooker offers excellent lighting for its various controls. A sizable back-lit LCD display allows users to read the time and temperature settings even under the least illuminating conditions. Who Should Buy This Item? The Cuisinart MSC-600 3-In-1 Cook Central 6-Quart Multi-Cooker was designed specifically for people who enjoy experimenting with various cooking techniques. By allowing users to cook different types of food using only one tool, users are not only able to save money (since they won’t need to buy different types of cooking tools), they also have fewer items to clean, once they’re done cooking. So if you’re the kind of person who enjoys cooking different types of food in different ways then you should give the Cuisinart Multi-cooker a try. Easy To Use: Cuisinart MSC-600 3-In-1 Cook Central 6-Quart Multi-Cooker allows users to cook in different ways using only one pot. This sort of feature is ideal for people who enjoy experimenting with different ingredients and cooking them in different ways. Because of the Multi-cooker’s versatility, users will no longer have to worry about cleaning their pots and pans very often. Cooking the same foods using the same cooker means that you will have to clean this item thoroughly, because if you don’t, some of the smells from previous ingredients might affect the smell and taste of your future meals. For example, if you tried steaming fish using the multi-cooker previously then you better clean the steaming rack thoroughly or your next meal might smell a little fishy. Although the Cuisinart MSC-600 3-In-1 Cook Central 6-Quart Multi-Cooker is relatively easy to clean, it is possible that certain smells may be left behind from previous ingredients. Because of this, it’s best not to take any chances. Keep cleaning the Multi-cooker until it smells completely clean. Considering the versatility of this device, getting value for your money is certainly not an issue. The Cuisinart MSC-600 3-In-1 Cook Central 6-Quart Multi-Cooker can function just as well as most cooking tools, so it really is multi-purpose and well worth money. The steaming and slow cooking functions are very popular among users, and most users have remarked that how they often enjoy the taste of their food when cooked using this device. Although not everyone needs a multi-cooker, there are some who consider cooking a hobby, and it is those people who should buy the Cuisinart Multi-cooker. The best way to purchase the Cuisinart MSC-600 3-In-1 Cook Central 6-Quart Multi-Cooker is to get it on Amazon. Amazon presently offers a lot of competitive prices for many cooking utensils, and they even include free shipping. So if you’re interested in trying the multi-cooker, simply click here to view it on Amazon. Also, if you’d like to know what people are saying about the Cuisinart MSC-600 3-In-1 Cook Central 6-Quart Multi-Cooker, you may want to read some of the reviews about the item on Amazon’s site. So if you would like to read some of their reviews, simply click on the following link to view the information. Looking For A Selection Of The Best Slow Cookers, That Are Both Stylish & High Quality And Will Look Awesome In Your Kitchen? Then you’ve come to the right place. There are so many different stylish crockpots to choose from, in all different colors, sizes and varying price ranges. Besides being so versatile and making the preparation of meals so darn easy, they have the added bonus of improving the look of your kitchen. Cooking is something that many people enjoy. There are so many different ways to cook foods. Some people grill out, while others cook at the stove. One way to cook food is using crock pots and slow cookers. There are many different options when it comes to cooking your food slowly without a grill. The most popular option involves using crocks, also known as slow cookers or crock pots, they’re all the same thing. They come in a huge variety of options such as oval, large, small, mini, stainless steel, black, white, red, and programmable. With all these choices, it is easy for someone to find what works best for them, their family size and their kitchen decor. One good thing about crock pots is that they take very little effort indeed by a person to cook a delicious meal. There are also many slow cooker recipe books for people to get ideas as to what they could cook. One crockpot that is very popular is a Cuisinart programmable slow cooker. There are two sizes for this cooker. One is a 6.5 quart programmable cooker and the other is a 4 quart one. It does not matter if someone is cooking for a few people or many people, Cuisinart has a programmable slow cooker that anyone would enjoy using. This programmable slow cooker is a great idea for someone who will be away from home for many hours, but wants to come home to a hot meal. These slow cookers can be made of several different materials. Many are round and are made of ceramic or porcelain. The most popular sizes for slow cookers are the three and a half, four, and five quart sizes. It is a good idea when cooking to fill the pot only about two thirds of the way full. This will leave room for moisture, and you do not have to worry about the pot boiling over. Hamilton Beach and Cuisinart are some of the more popular brands. They offer a wide variety of slow cookers, and even make some of the very popular stainless steel slow cookers that people love so much. Cooking is made so easy when you use a crock pot. Meals can be prepared with very little effort. The quality of the taste is outstanding, and there are many foods that are ideal for a slow cooker like beef stew. There are so many choices of slow cooker recipes, you will be spoiled for choice. If you are having company over, but do not want to spend all day in the kitchen, then use a slow cooker to make the meal. That way you can have the satisfaction of cooking a great meal and enjoying company at the same time! Would you like to serve your family a healthy, delicious and satisfying meal on a daily basis in spite of your crazy busy schedule? The Crock-Pot SCVT650-PS 6-1/2-Quart Programmable Touchscreen Slow Cooker is the best suitable gadget for the chef on the go. In fact, this isn’t just a gadget, this is a considerable investment that will have your family eating healthy home-cooked meals rather than just ordering fast food after a busy and tiring day. Easy as I – 2- 3, your dinner will be ready and waiting for you at the end of your busy day. First, put all the ingredients in the pot, set your cooking time, go about your day and come home to a delicious ready dinner, or you may also program this at night so when you wake up, breakfast is ready. This is made possible by the programmable timer feature that can be set from 30 minutes to 20 hours and the automatic keep warm feature that will keep your food warm after the timer runs out. The touchscreen control panels make it in time with the 20th century and easy to use as well. A very spacious 6.5 quarts interiors can easily accommodate servings that can easily feed seven to eight people. Perfect for a weekend dinner with the whole family, special events and gatherings or just plainly for everyday use. The removable stoneware crock is very flexible. It can be removed, and you can leave it in the fridge with the left overs, use it in the oven, put it in the microwave, or on the stove, you may also use it as a serving dish. One advantage of being able to put the stoneware directly on the stove is that you can saute your ingredients (like onions and garlic etc), brown your meat, caramelize vegetables before setting it up in the slow cooker; resulting in a much more flavorful and tasty meal. The dishwasher-safe feature for the stoneware and the glass lid can save you time and effort cleaning up. This is easy to clean if you are going to manually wash the slow cooker. The busy housewives, the working moms, people who want to eat healthy, and for everyone who wants to multitask because of a very limited time to cook. The Crock-Pot SCVT650-PS 6-1/2-Quart Programmable Touchscreen Slow Cooker can give you a flavorful, healthy, warm and satisfying meal every day. Versatility. The versatility of this slow cooker is truly impressive. You might be expecting to cook just stews or pot roast, but with the bonus cookbook that comes with it, you will be surprised to discover that there are so many recipes even desserts that you can try. Ease of use. This is very easy to use and comes with a beeping alert and light indicator that both inform you that you are done the cooking. A great feature if you will be just around the house while you are cooking. Efficient timer and keep warm feature. After it is finished cooking, your food will automatically be kept warm. Another added feature is the timer that shows how long it has been in warm mode. Durable. What makes this slow cooker a stand out from others is when it was tested, it continuously cooks for straight maximum twenty hours instead of power cycling every six hours like the other brands do. This is one of the factors why this specific brand has been highly recommended by Cook’s Illustrated (by Cook’s Country). Elegant and Easy to Clean. The stainless steel exterior design is very elegant, easy to maintain and clean. If you need to clean it, just use a damp cloth on it; very simple and low maintenance. Because of its stainless steel material, you are assured of its durability and quality that can last for a long time. The slow cooker’s size may intimidate a family that is smaller in number. You can still enjoy the benefits of having a healthy meal out of this slow cooker; all you have to do is cut your serving size, you don’t have to fill the whole pot. The results for the cooked food still taste just as good. With all the benefits like the programmable timer, keep warm settings, flexible stoneware, dishwasher safe, stainless steel exterior and a free cookbook, it is easy to see the price for this very modern slow cooker as a bargain in comparison to other slow cookers in the market. Where to buy and read more reviews? Go to your local appliances store; this is available to most distributors in the US. You may also go online at Amazon.com easy purchase, and it will be delivered right to your doorstep. Time Saving. The Slow Cooker you decide to purchase should ultimately help contribute to saving your time. The whole purpose of a Slow Cooker is to help you save time on the whole cooking process. Simplicity. The best slow cookers are the ones which are extremely simple to use. It’s always best, where possible, to invest in an appliance with a LCD screen as you’ll be able to control the whole cooking process with the touch of a button. Performance. Since you’ll want extremely delicious food, we recommend searching for a slow cooker which incorporates powerful cooking functionalities into it. Some cheaper priced appliances simply lack the cooking power needed to properly cook meat. Reliability. You’ll want an appliance which is built to last for years to come. Check the warranty period on each appliance. Reviews and Ratings. It’s important to always get a second opinion before making a purchase. Apart from reading our Slow Cooker Reviews, ensure that you read “Amazon Verified Purchase” reviews directly from the product’s page. These reviews indicate that the customer has actually purchased the appliance. What Is The Best Slow Cooker Of 2019? We would thoroughly recommend looking into the Cuisinart MSC-600. While it’s on the pricey side, it also doubles up as both a multi-cooker and a rice-cooker, meaning that you’ll only need to invest in one appliance, instead of three – thus saving you money long-term. If you are on a budget check our other slow cooker reviews, most of them are far below $100. Do You Purchase Each Slow Cooker That You Review? Yes. We personally invest our own money into each slow cooker model, which is why we’re only available to review a select few. We try to review a different model every few weeks, although this is limited by both our own personal commitments and whether we have spare funds available. Yes. Every time you click through to one of our partner sites, such as Amazon, you will be tagged with our tracking ID which earns us a small commission on each item sold. You don’t have to use these links, although it does help us to continue to our slow cooker reviews site and review new models. If you don’t want to use our links, we would appreciate it if you could recommend us to your friends in the future when they need a new Slow Cooker. Are there any disadvantages to Slow Cooking? Unfortunately, yes. According to Wikipedia, vitamins and other nutrients are lost during the cooking process, which means that Slow Cooking isn’t the healthiest option out there. Additionally, you do not have the pleasure to add in ingredients on-the-fly as heat will be lost during this add/remove process. Instead, you need to add all of the ingredients in at the same time. Slow cookers are an excellent way to prepare tasty and healthy food. Yes, it takes time but some things are best waited upon. Besides, cooking meat in slow cookers tenderizes the meat better. Now if you have made a commitment to purchase a slow cooker then you probably haven’t yet zeroed in on the right manufacturer or model. This guide will let you do just that, without pulling your hair out. Let’s start with the top three that need answering. Remember that what you read on the box or in advertisements is in most likelihood not exact. So a six liter slow cooker might have 4 and a half liter capacity in reality. However, slow cookers on an average provide around two thirds of the total stated capacity to users. Using this norm, you should evaluate the size or capacity ideal for your requirements. Usually, a large family of 5 or more members will find a six liter crock pot perfect. It should feed up to eight hungry stomachs at once. Now for couples, a small 3.5 liter capacity will suffice. Are You Planning On Making Whole Chicken? While this is not on the top of the To Do List, for many slow cooking enthusiasts, everyone ends up trying out a whole chicken recipe in a slow cooker once in their life time. However, if you really plan on maximizing your slow cooker to make exotic whole chicken recipes then opt for an oval cooker as they can accommodate a complete chicken with ease. For those interested only in curries and stews, the shape does not matter. Do You Need Smart Timer Controls? Features such as keep warm setting, timer operation are expensive in a slow cooker. Furthermore, digital controls add to the cost. Cheap cookers usually come with three basic options of high, low and auto warm. Figure out what you really need before spending the big bucks. Removable pot – This is a must have featured today in all slow cookers. It lets you clean up easily afterward and even transport your creation to the dinner table or to a potluck party. Glass Lid – Again another must have feature, good quality glass lids pack in the moisture and maintain optimum cooking pressure helping tenderize meat better and retain liquids more with reduced evaporation. Temperature Settings – Not a vital requirement but its nice knowing what temperature the slow cooker is set at. This is great for recipes that call for a specific temperature to bring out subtle taste differences. Cooking at varied temperatures for different time periods is only possible if your slow cooker has a precise thermostat and temperature settings. Programmable Cooking – Whether it’s for one hour or many hours, having the ability to program a slow cooker on the total time of cooking lets you concentrate on other stuff in life. This feature saves you effort and time. Once you add in the ingredients, set the timer and program the slow cooker operations, you can leave it as it is. When its done cooking, it will automatically switch to the keep warm feature, maintaining high temperatures to resist bacteria formation and preserve the taste. Locking Lid – Having the ability to carry along your slow cooker to outdoor parties, roast sites and camping grounds is a definite advantage. A locking lid helps by ensuring everything inside stays intact without any spills. This is also great when carrying the slow cooker from the kitchen to the dining table. Additional Accessories – Not all that important as long as you get a decent slow cooker, some accessories can really help out. For example, skillet based slow cooker designs let you use the pot for stovetop recipes, the slow cooker base as a skillet and together they form a slow cooker. Having a spatula along with the slow cooker, interchangeable bowl sizes all help, but not that much. Warranty – This is one feature that you must pay special attention to. Usually, slow cookers feature 1 year warranty but some places like Amazon let you extend the warranty to two or even three years, which in turn safeguards your investment.